As a child, I used read anything that I could lay my hands on- from Phantom and Mandrake the Magician to Champak and Chandamama; from Amar Chitra Katha comic books to Marvel and DC comics; from Enid Blyton and Anna Sewell to Sane Guruji and Faster Fene in Marathi. The old and yellowed pothis and purans and Shukravar chya Katha (religious books with stories and illustrations) that were a part of my grandmother’s collection were as interesting as the stories of the Greek Gods or Beowulf. These characters made a lasting impression on my little mind and heart. But the most fascinating, impressive and all-rounder character of them all was Krishna, my most favourite among the Hindu Pantheon. The cute little brat’s escapades would put Dennis the Menace or Tom Sawyer to shame. The clever youngster who defeated Kalia the snake was smarter than Frederick Algernon "Fatty" Trotteville from Enid Blyton’s Five-Find-Outers. The shrewd and brave charioteer of Partha inspired more faith and trust than Phantom, the Ghost-who-walks or Hercules. The tactful friend who took such care of the poor Sudama seemed more loyal than Pythias who did not fail to return to free Damon. A little later in the journey, came the realisation that the strong dark and handsome hero, who graciously assumed as many forms as the number of gopis, giving each lady the satisfaction that he was there to dance exclusively with her, was no Casanova. He was more chivalrous than any Arthurian knight and more romantic than a Mills and Boon hero.The16,000 wives could only be an indication of his generous patronage and protection extended to thousands of damsels in distress, and not a sign of depravity like that of Bluebeard. And much later, Socrates’s wise and patient tolerance of Xanthippe’s quarrelsome ways pales in comparison to Krishna’s sagacious handling of Satyabhama’s possessiveness. Such a superhero, such a multi-faceted being could only be called Krishna, the “all attractive”! Here’s wishing the cute, naughty, funny, clever, kind, smart, wise and witty Krishna a very happy birthday! 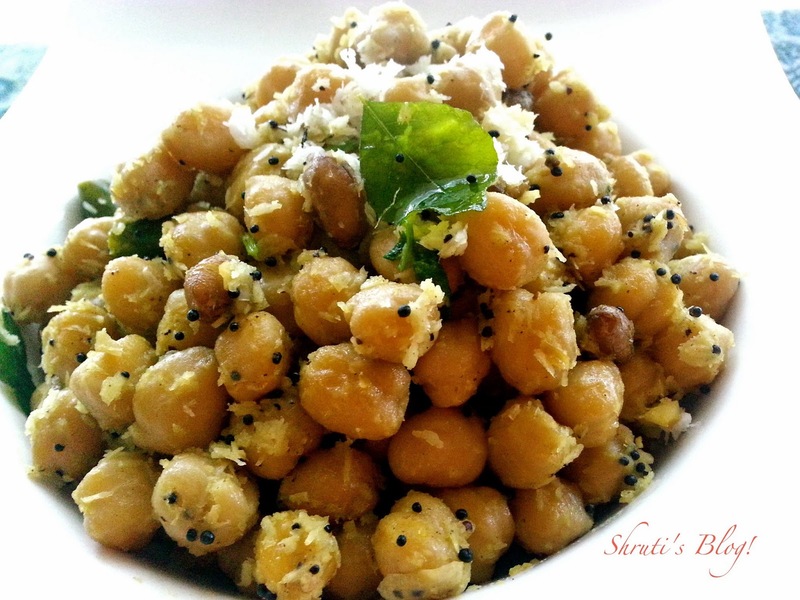 This is a Janmashtami favourite from the south, using the kabuli chana of the north. 1-2 green chillies, chopped. You can use dry red chillies as well. Cook the chickpeas and peanuts till soft done. I usually add some salt, so it gets infused. In a pan, heat 1 tbsp oil and the urad dal. As it begins to turn golden, add mustard seeds to splutter. Then add the chillies, asafetida, curry leaves and grated ginger. Immediately add the boiled chickpeas and peanuts. Mix well and adjust the salt and fry for a few minutes. Add lemon juice and the grated coconut and mix well. 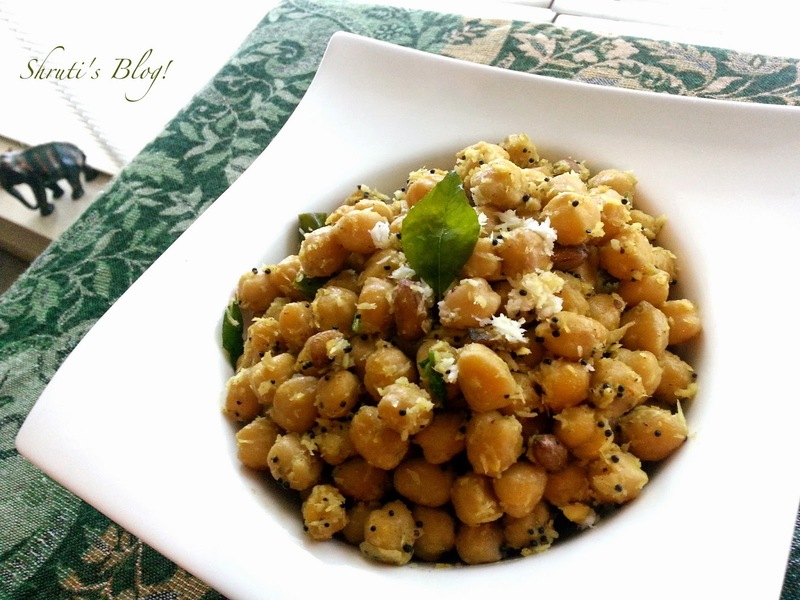 This dish is suitable for naivedya and makes a very tasty prasad.